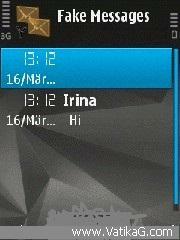 Download Section: Miscellaneous of Category: Symbian s60v3 softwares - VatikaG free downloads portal. Description : Bored someone that like to borrow or use your mobile phone.fakeerror is simulate tool for help you avoid from these situation. Description : Emoze brings true mobility to the mass market by enabling users from all walks of life to turn their mobile phones and mobile devices into a fully functional personal communication device. emoze has created real push event technology. emoze delivers real time, secure synchronization of emails, calendars and contacts pushing data and updates anytime, anywhere using any mobile service provider network or wifi. with emoze s unique technology, synchronization occurs every time there is an incoming or outgoing event, rather than via periodical checks for change. Description : With profile scheduler you can automate your profile changing with timer, so you can enjoy your good night sleep being off line without disturbing phone calls, and be back on line automatically even before you actually wake up. 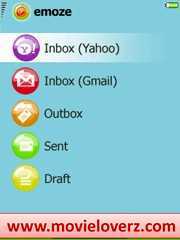 Description : Fake messages is a free fake message sending application that allows timed "sending" of fake sms messages. sms messages are handled inside the device, so no network connection is needed, thus sending fake sms messages are completely free of charge. Description : Full version: dictionary v2.9 (vikrant p. chavan)free compatible with all j2me devices. easy to use.key description right next word.left previous word.up scrollup.down scrolldown. main menu. 1 backspace. record bookmark. 0 go to bookmark. Description : A mobile phone is an excellent servant, but it has turned a peaceful life of many people to hell in a moment. it can be just a slight lack of attention and a confidential information from sms or a confidential phone call information will reach unwanted hands, resulting in a disaster. it does not have to be just a wife or husband, girlfriend or boyfriend or a rival company colleague of yours. black & white guard minimizes that risk, it automatically cleans your cell phone of confidential sms messages and information about phone calls.only few people know that better phones are able to save information about realized calls or sent or received sms into two independent lists. 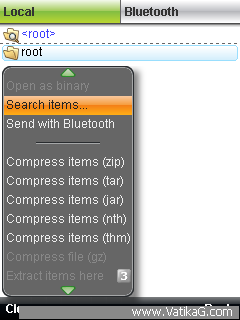 you can delete message but more advanced user is able to find information about its sending in another list. 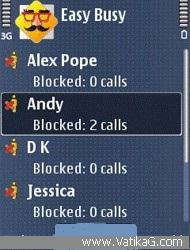 similar situation is with calls. your troubles can arise if somebody unwanted gets hold of yourmobile phone . you avoid it by installing and well setting application black & white guard which automatically cleans up confidential data from yourmobile phone. those data including sms are easy accessible only for you after entering the password.black & white guard has another useful functions, like the black list and mobile phone keyboard locking. 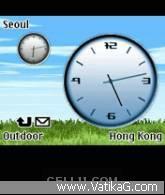 Description : Clock screensaver is a symbian application to display twoclocks with different time zone as a screensaver.